BOGOTA (Reuters) - Colombia's peace talks with Marxist FARC rebels were in crisis on Monday as troops scoured a Pacific coast region for an army general kidnapped over the weekend in a brash move by guerrillas that endangers efforts to end 50 years of war. President Juan Manuel Santos suspended the negotiations in Havana after General Ruben Dario Alzate, who heads the Titan task force in the western department of Choco, was captured by the Revolutionary Armed Forces of Colombia (FARC). The rebels also took another military official and a civilian when they were disembarking from a boat on a river near the city of Quibdo during a visit to an energy project. "Negotiators were to travel to another round of talks in Havana," Santos, who has staked his presidency on ending Latin America's longest-running insurgency, said early on Monday. The military dispatched troops by air, river and land to search the poor and violence-stricken jungle region that has three major rivers and large tracts of untamed coastline. Lawmakers urged Alzate's return and the re-start of negotiations, though supporters of former President Alvaro Uribe - a bitter right-wing critic of the talks - also expressed satisfaction that dealings with the FARC were suspended. An earlier 3-year-long peace process with the rebels collapsed in 2002 after Senator Jorge Gechem was kidnapped by the FARC. He was held captive for six years before being released. The rebels did not immediately comment on the kidnapping of Alzate, the first general to have been seized since the war began in 1964. Local press described him as a 55-year-old father-of-two with a three-decade military career. "It is very difficult to speak from here, and to know what really happened," a FARC source told Reuters in Cuba. Rebel leaders at the talks have occasionally dissociated themselves from violent attacks by lower ranks in Colombia, raising the possibility they could defuse tension by securing the general's release. The government will work with the International Committee of the Red Cross (ICRC) to seek the hostages' release. "We hope to do everything possible to return these three people to their loved ones," an ICRC spokeswoman said. Santos had publicly warned the FARC it risked jeopardizing the peace process after the abduction of two soldiers last week and continued attacks on infrastructure. The FARC has stopped kidnapping for ransom but maintains that military personnel are fair targets in the absence of a ceasefire. 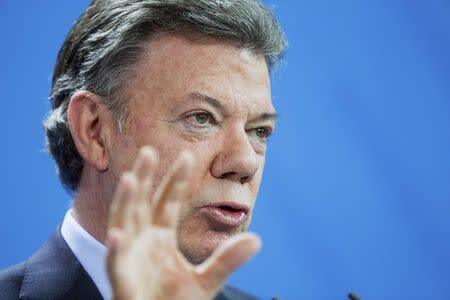 Alzate entered the area in a civilian capacity, breaking security protocol, Santos said. This is not the first suspension of the two-year-old talks. 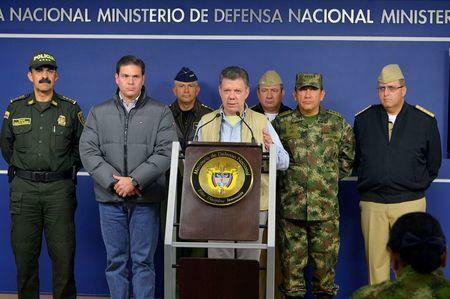 The FARC stopped them in August 2013 to review the government's plan to put any peace deal to a referendum. The halt in talks would not affect the country's economy, Finance Minister Mauricio Cardenas told journalists at a banking conference in the city of Medellin. The Colombia stock market was closed on Monday for a holiday.